I’m sort of the artist-in-residence for a shiping container this week. It’s for a project called 3rd Ring Out, which is part disastr simulation game, part partipatory scenario planning workshop, part installation about imaginary futures, part climate change awareness tool. Audiences make and vote on suggestions for Edinburgh’s future (and futureproofing). My job is to imagine that future and come up with creative ways of displaying it. Right now I’m writing A Concise Chronology of the Edinburgh Housing Crisis:the Great Class War of EH1 and/or Civil Unrest in East Lothian 2015 – 2050. Last night I made the schematic below. In 2016 Edinburgh City Council initiated the Urban Garden Reclamation Scheme. 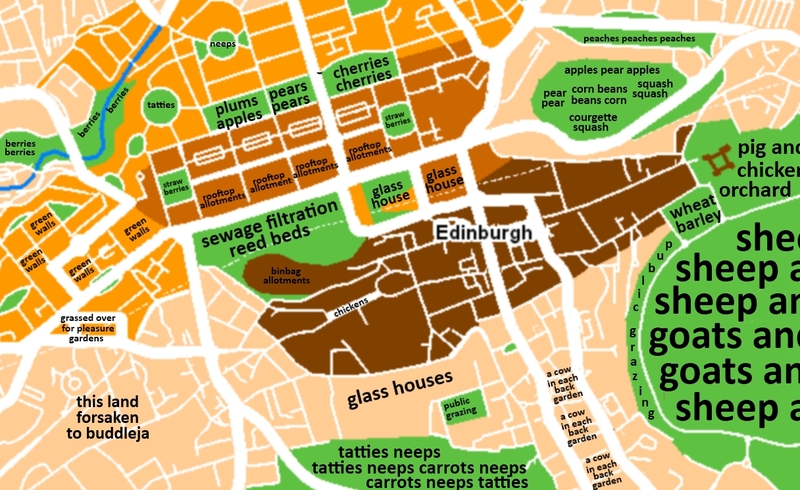 Initially sketched by two hungry councillors on the back of an envelope, the attached schematic laid the path for 86% self-sufficiency in food for Edinburgh by 2050. It’s kind of fun, kind of interesting, kind of cool. Come have a look! The game is fairly cheap, and the installation is free. ← Me! August! Poetry! Gigs!